ICNLSP 2018: "Artificial Intelligence and Machine Learning Challenges", The 2nd International Conference on Natural Language and Speech Processing", Algerian National Library, April 25, 26, 2018. WCLAA 2017: "Exploring Sentiment Analysis via Deep Learning", The First Workshop on Computational Linguistics and Applications to Arabic, Computational Linguistics Department, CRSTDLA, Algeria, December 2017. ICEE 2017: "Difference Between Artificial Intelligence, Machine Learning and Deep Learning", The Fifth International Conference on Electrical Engineering, University of Boumerdes, Algeria, October 2017. JLCPTS 2016: "Traditional Artificial Intelligence vs. Deep Machine Learning: Advantages and Limitations", Workshop of the Speech Communication and Signal Processing Lab, Journées du Laboratoire, December 05, 2016, LCPTS, FEI, U.S.T.H.B. , Algiers, Algeria. 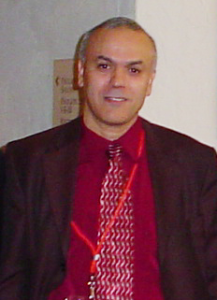 ISCV 2015: "Exploring Machine Learning Paradigms: Current and Future Trends", The first International Conference on Intelligent Systems and Computer Vision, Fez-Morocco, March 2015. ICAR 2015: International Conference on Applied Research in Computer Science and Engineering, Lebanon, 2015. ICEE 2015: The Fourth International Conference on Electrical Engineering, University of Boumerdes, Algeria, December 2015. WOSSPA’13: The Eight International Workshop on Systems, Signal Processing and their Applications, May, 2013, Hotel Safir Mazafran, Zéralda, Algiers, Algeria. “Machine Learning Techniques in Computer Vision”, International Conference in Computer Vision and Robotics, Centre of Development and Advanced Technologies, Algiers, June 2011. "Introduction to Topological Hidden Markov Models: Analysis and Effect of Growth/Aging on Human Face Prediction"
invited by Prof. Y. Bennani, Institut Galile'e (apprentissage non supervise' a base de mode`les de Markov cache's structure's et topologiques), LIPN UMR 7030 du CNRS, Universite Paris XIII, Nord, France. “Extension of Hidden Markov Models into Structural Hidden Markov Models”, 2003 IEEE International Conference on Systems, Man & Cybernetics , October 2003, Hyatt Regency, Washington, D.C., USA. “Combination of Probabilistic Logic/Minimum Perplexity Principle: Application to Language Modeling”, CSE Depart. Oakland University, February 2005. “Applied Research Review in Pattern Recognition”, Oakland University, Octobre 2003 invited by Michigan Industrial Partners. “Combining Algebraic/Topological Structures with “Stochasticity”: Application to Object Classification”, Mars 2002. “Mapping Objects Designs to Human Perceptions”, Chrysler, Rochester, Michigan, USA, Novembre 2001. “Pattern Recognition in Practice”, Oakland University, Michigan, USA, October 2000. “Solving the Sparse Events Problem through Probabilistic Logic: Application to Speech Recognition”, Department of Mathematics, Oakland University, USA, March 2003. “Incorporating Signal with Language Sources in a same Bayesian Framework”, Computer Science Department, State University of New York at Buffalo, USA, February 2000. “Comparing the Gibbs Markov Random Field Classifier to others (NN, GA)”, Université du Québec a Montréal, Canada, May 1996. “The Contribution of Hidden Markov Models in Natural Language Processing”, Université du Québec à Trois Rivières, Québec, Canada, June 1995. “Logique Probabiliste et Entropie”, Université Joseph Fourier, Grenoble, France, May 1993. “Mining Customers’ Preferences for Automotive Design”, DaimlerChrysler/Tacom, September 2002. “Pattern Recognition in Practice”, DELPHI Automotive Company (HQ), Avril 2001. “A Dynamical Information Retrieval System using a Gibbs-MRF distribution concept”, Congrès ACFAS’95, Canada. “Application du Réseau de Neurone ART (Adaptive Resonance Theory) au Problème de la Chaîne de Traitement Terminologique”, Congrés ACFAS’95, Canada. “A Sampling Procedure and a Vectorial Markov Chain for Parts of Speech Tagging”, Rank Xerox Research Center, Grenoble France, December 1993. “Les chaînes de Markov dans Cristal”, Séminaire sur les diverses applications des processus markoviens", Institut National de Télécommunication, INT, Ivry Paris, France, June 1993. “Mining Customers’ Preferences for Automotive Designs”, Southfield, Michigan, Mars 2003, invited by the IEEE Chapter V.
“Molecular and Computational Prediction of Functional Repertoire of Microbial Community Stressed by Metal Pollution”, Department of Energy (DOE), Washington DC, June 2002.